For those of us that have dreamed of a simple, modern home, the Stitch House is the perfect fit. Pricing begins at at approximately $302,000, which includes virtually everything besides the land itself. Thanks to a smart and efficient design that leverages the benefits of modular construction, minimalism is now affordable. 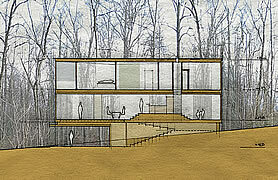 To learn more about what's included in our price for the Stitch House, see our How to Own section. To begin the process of building a Stitch House on your site, contact a Wieler representative. Live in a Work of Art™.